The breed standard below is that which is used in Australia. CHARACTERISTICS - Biddable, intelligent and possessing natural working ability. TEMPERAMENT - Kindly, friendly and confident. HEAD AND SKULL - Balanced and well-chiselled, skull broad without coarseness; well set on neck, muzzle powerful, wide and deep. Length of foreface approximately equals length from well-defined stop to occiput. Nose preferably black. MOUTH - Jaws strong, with a perfect, regular and complete scissor bite, i.e. Upper teeth closely overlapping the lower teeth and set square to the jaws. BODY - Balanced, short coupled, deep through heart. Ribs deep, well sprung. Level topline. HINDQUARTERS - Loin and legs strong and muscular, good second thighs, well bent stifles. Hocks well let down, straight when viewed from rear, neither turning in nor out. Cowhocks highly undesirable. TAIL - Set on and carried level with back, reaching to hocks, without curl at tip. 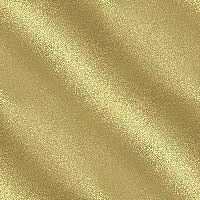 COAT - Flat or wavy with good feathering, dense water-resisting undercoat. I have sourced an number of excellent articles in order to produce this page. BACK: The portion of the topline between the loin and the withers. CROUP: The muscular area above and around where the tail connects to the body. DEWCLAW: A fifth claw which is located in the inside of the front feet, and is higher than the other toes. (dewclaws can get ripped or torn - always keep your golden's dewclaws trimmed short). 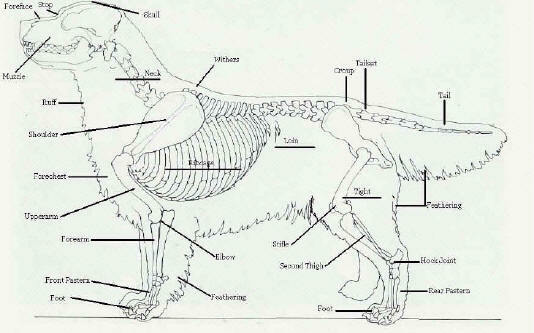 HOCK: The joint on the rear of the back legs, between the rear pastern and stifle. LOIN: The section of the body located on both sides of the backbone between the ribs and the hips. MUZZLE: The front part of the jaws. PASTERN: The section of the leg below the knee of the front leg or below the hock of the hind leg. STIFLE: The knee joint of the hind leg. "Hindquarter Angulation" refers to the angle formed at this joint. STOP: The frontal portion of the skull between the eyes and the top of the head. WITHERS: Located just behind the base of the neck. A dog's height is measured at the withers. 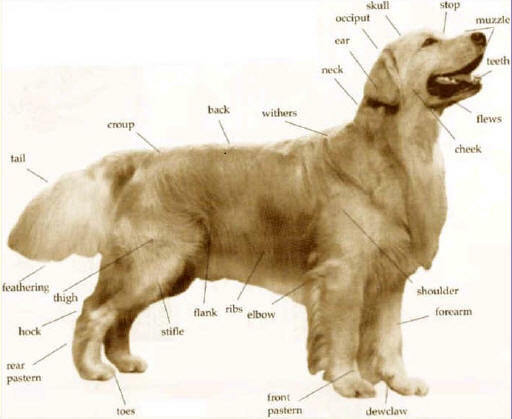 The following sketch will enable you to recognize the almost perfect conformation of a Golden Retriever and eventually understand when a judge notices straight shoulders or stifles. The standard doesn't mention anything about Height / Length proportions. The dog must be slightly longer than it is tall, with a 11/12 ratio. The sketch below shows a golden with such a ratio. The breed standard calls for " Any shade of gold or cream, the coat can be neither red nor mahogany. A few white hairs are permissible but only on the chest." As a result there can be a large variation in the colour of golden retrievers.